Pour the milk into a pot. Scrape the inside of the vanilla bean with a knife, add the black seeds and the emptied bean to the milk. Bring to a boil over low heat to infuse the vanilla. Add the egg yolks to a large bowl. Add the sugar, beat vigorously until the mixture whitens and the sugar cristals have dissolved. Slowly add the cornstarch or flour to the eggs and sugar mixture. Beat delicately so as to not form any lumps. Once the mixture is smooth, pour half the hot vanilla-flavored milk onto the eggs. 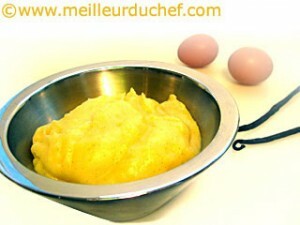 Mix delicately at first, then more energetically so as to relax the custard. To avoid a crust forming on the surface, rub the custard with 50g butter. This way, the custard will remain smooth and appealing. If the custard is too fluid, it has not cooked long enough. Place it back over low heat until the proper consistency is obtained. After cooling, if the custard is too thick, run it through a food mill or a fine strainer.